Allergic reactions are sensitivities to substances called allergens that come into contact with the skin, nose, eyes, respiratory tract, and gastrointestinal tract. They can be breathed into the lungs, swallowed, or injected. Allergic reactions are common. The immune response that causes an allergic reaction is similar to the response that causes hay fever. 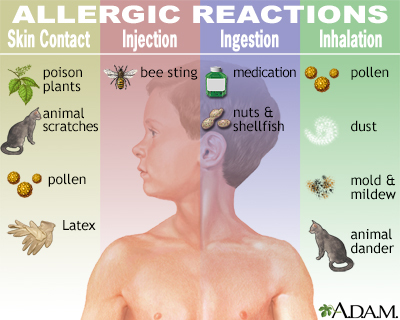 Most reactions happen soon after contact with an allergen. Many allergic reactions are mild, while others can be severe and life threatening. They can be confined to a small area of the body, or they may affect the entire body. The most severe form is called anaphylaxis or anaphylactic shock. Allergic reactions occur more often in people who have a family history of allergies. Substances that don't bother most people (such as venom from bee stings and certain foods, medicines, and pollens) can trigger allergic reactions in certain people. First-time exposure may produce only a mild reaction. Repeated exposures may lead to more serious reactions. Once a person has had an exposure or an allergic reaction (is sensitized), even a very limited exposure to a very small amount of allergen can trigger a severe reaction. Most severe allergic reactions occur within seconds or minutes after exposure to the allergen. Some reactions can occur after several hours, particularly if the allergen causes a reaction after it has been eaten. In very rare cases, reactions develop after 24 hours. Anaphylaxis is a sudden and severe allergic reaction that occurs within minutes of exposure. Immediate medical attention is needed for this condition. Without treatment, anaphylaxis can get worse very quickly and lead to death within 15 minutes. 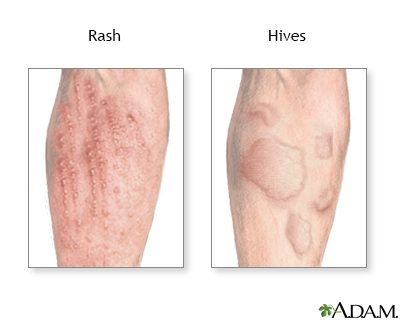 Rashes involve changes in the color, feeling or texture of your skin. Calm and reassure the person having the reaction. Anxiety can make symptoms worse. Try to identify the allergen and have the person avoid further contact with it. 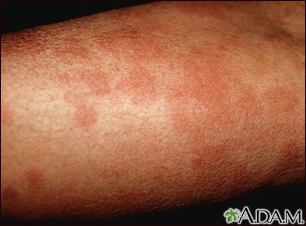 If the person develops an itchy rash, apply cool compresses and an over-the-counter hydrocortisone cream. Watch the person for signs of increasing distress. Get medical help. For a mild reaction, a health care provider may recommend over-the-counter medicines, such as antihistamines. Check the person's airway, breathing, and circulation (the ABC's of Basic Life Support). A warning sign of dangerous throat swelling is a very hoarse or whispered voice, or coarse sounds when the person is breathing in air. If necessary, begin rescue breathing and CPR. Calm and reassure the person. If the allergic reaction is from a bee sting, scrape the stinger off the skin with something firm (such as a fingernail or plastic credit card). Do not use tweezers -- squeezing the stinger will release more venom. If the person has emergency allergy medicine on hand, help the person take or inject the medicine. Avoid oral medicine if the person is having difficulty breathing. Take steps to prevent shock. Have the person lie flat, raise the person's feet about 12 inches (30 centimeters), and cover them with a coat or blanket. Do not place the person in this position if a head, neck, back, or leg injury is suspected or if it causes discomfort. Do not assume that any allergy shots the person has already received will provide complete protection. Do not place a pillow under the person's head if he or she is having trouble breathing. This can block the airways. Do not give the person anything by mouth if the person is having trouble breathing. The person is having a severe allergic reaction. Do not wait to see if the reaction is getting worse. The person has a history of severe allergic reactions (check for a medical ID tag). Avoid triggers such as foods and medicines that have caused an allergic reaction in the past. Ask detailed questions about ingredients when you are eating away from home. Carefully check ingredient labels. If you have a child who is allergic to certain foods, introduce one new food at a time in small amounts so you can recognize an allergic reaction. People who have had serious allergic reactions should wear a medical ID tag and carry emergency medicines, such as a chewable form of chlorpheniramine (Chlor-Trimeton), and injectable epinephrine or a bee sting kit, according to your provider's instructions. Do not use your injectable epinephrine on anyone else. They may have a condition, such as a heart problem, that could be made worse by this drug. Custovic A, Tovey E. Allergen control for prevention and management of allergic diseases. In: Adkinson NF Jr., Bochner BS, Burks AW, et al, eds. Middleton's Allergy Principles and Practice. 8th ed. Philadelphia, PA: Elsevier Saunders; 2014:chap 86. Lieberman P, Nicklas RA, Randolph C, et al. Anaphylaxis -- a practice parameter update 2015. Ann Allergy Asthma Immunol. 2015;115(5):341-384. PMID: 26505932 www.ncbi.nlm.nih.gov/pubmed/26505932. Wasserman SI. Approach to the patient with allergic or immunologic disease. In: Goldman L, Schafer AI, eds. Goldman-Cecil Medicine. 25th ed. Philadelphia, PA: Elsevier Saunders; 2016:chap 249. Allergic reaction can be provoked by skin contact with poison plants, chemicals and animal scratches, as well as by insect stings. Ingesting or inhaling substances like pollen, animal dander, molds and mildew, dust, nuts and shellfish, may also cause allergic reaction. Medications such as penicillin and other antibiotics are also to be taken with care, to assure an allergic reflex is not triggered. 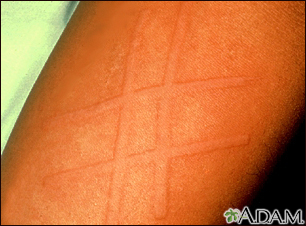 Dermatographism is a condition where lightly scratching the skin raises wheals or welts. Histamine is released, which causes the small blood vessels (capillaries) to dilate, producing redness and localized swelling. 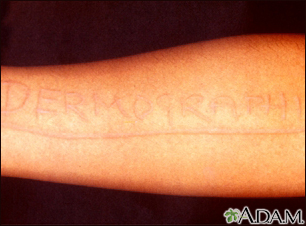 Dermatographism is a condition where lightly scratching the skin raises wheals or welts. Histamine is released at the site, causing the small blood vessels (capillaries) to dilate, producing redness and localized swelling. 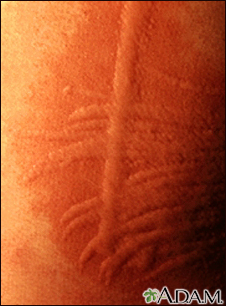 Hives (urticaria) are raised, red, itchy welts, seen here on the arm. The majority of urticaria develop as a result of allergic reactions. Occasionally, they may be associated with autoimmune diseases, infections (parasitosis), drugs, malignancy, or other causes. 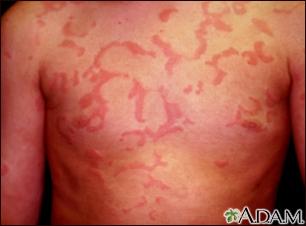 Hives (urticaria) are raised, red, itchy welts, seen here on the chest. The majority of urticaria develop as a result of allergic reactions. Occasionally they may be associated with autoimmune diseases, infections (parasitosis), drugs, malignancy, or other causes. 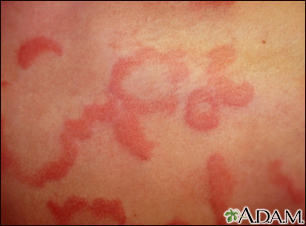 Hives (urticaria) are raised, red, itchy welts. The majority of urticaria develop as a result of allergic reactions. Occasionally, they may be associated with autoimmune diseases, infections (parasitosis), drugs, malignancy, or other causes. This person has raised, red, itchy welts (urticaria) on the chest and abdomen. The majority of urticaria develop as a result of allergic reactions. Occasionally, they may be associated with autoimmune diseases, infections (parasitosis), drugs, malignancy, or other causes. 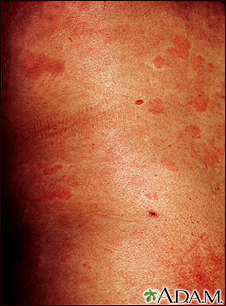 In dermatographism, hives are readily produced if the skin is lightly scratched. Wheal formation at the site of light scratching of the skin. Allergic reaction is a sensitivity to a specific substance, called an allergen, that is contacted through the skin, inhaled into the lungs, swallowed or injected. The body's reaction to an allergen can be mild, such as a localized rash, or life-threatening, such as anaphalactic shock. Reviewed By: Stuart I. Henochowicz, MD, FACP, Associate Clinical Professor of Medicine, Division of Allergy, Immunology, and Rheumatology, Georgetown University Medical School, Washington, DC. Also reviewed by David Zieve, MD, MHA, Medical Director, Brenda Conaway, Editorial Director, and the A.D.A.M. Editorial team.